We hate the impact that higher Auto Insurance premiums have on our clients. 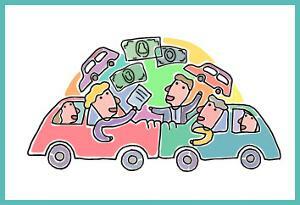 We get asked all the time what can I do to lower my Auto Insurance Premiums. The answers to this question are many, some personal and immediate ways to save on car insurance , some political and long-term. All are important for each of us. Below are some best practices and social actions that will impact your Auto Insurance Premiums. Drive defensively and within speed limits. In bad weather, drive accordingly. Or don't go if you don't have to. Drive defensively and to suit road conditions. Always use safety belts. Always make those riding with you use them too. Never drive under the influence. Always try to park in well-lit areas. Lock your car and take the keys. Install an anti-theft device in your car. I love cars that tell me “get away from me”! Guaranteed Quality Replacement Parts can be equal to or better than original equipment. Think air bags, automatic safety belts and anti-lock brakes. Always buy a car with a 5 mph bumper. Make air bags a priority in your next car. They save injury, they save lives. Support legislation to crack down on drunk and reckless driving. Support police in their traffic enforcement efforts. Support legislation to improve the safety and construction of automobiles. Understand that using minor bodily injuries to gain a major cash award raises everyone's rates. Encourage legislators and insurance officials to enact a good no-fault law. We have saved people hundreds of dollars a year on their Florida Auto Insurance. Call today or request our no obligation free auto quote.